The first thing we'll do is create a character controller. Before this part of the tutrial, read the following article of the manual. It takes about 5 minutes and it will give you the very basic notions you need to know about graphs, machines and macros. For the player controller, we will use a flow machine. On your machine component, you first need to create a new macro for our player logic. We will repeat this process often in the tutorial for the different graphs we create. From now on, if you see "create a new macro for your graph", use the same process that we described here. We want the character to move left and right, depending on the horizontal input axis. The horizontal input axis is a pre-configured Unity input shortcut that represents, for example, A and D on a keyboard, or the left joystick on a controller. When you go left, it returns -1, and when you go right, it returns +1. How fast to move will be controlled by a speed variable that we can tweak to adjust the gameplay. Because this is the first time we create a variable and add units to our graph, we'll show you every step along with gifs. But to speed things up for the rest of the tutorial, after this section we'll only give you the steps and the final screenshots. Then, we need to get the horizontal input axis. We can do that with the Get Axis unit. Type Horizontal in the axis name field. You will notice the new unit shows up as dimmed out. This is because we're not using its value anywhere yet, so Bolt warns us that is is currently useless by fading it out. If you want, you can disable this by toggling off in the graph toolbar. Next, we need to multiply this value with our speed object variable. We can use Bolt's contextual menu to make that easier. Note: Variable units have been improved in v.1.2 after this tutorial was written. They should look slightly different (with dropdowns), but they are functionally the same. ... and store it in a variable called Movement. Our player isn't moving yet, but we know by how much it should move. We didn't create it beforehand like we did for the player's speed, because we didn't need to give it a default value. Bolt supports dynamic variables, meaning you can create new variables during play mode on the fly by just assigning them a value like we just did. We used a graph variable instead of an object variable, because we will only ever need the movement inside this graph -- no need to share it with the outside world. Whew. This was pretty boring, but now you know all the basics: creating graphs, variables and units. Now, we'll pick up some speed and actually make something happen. 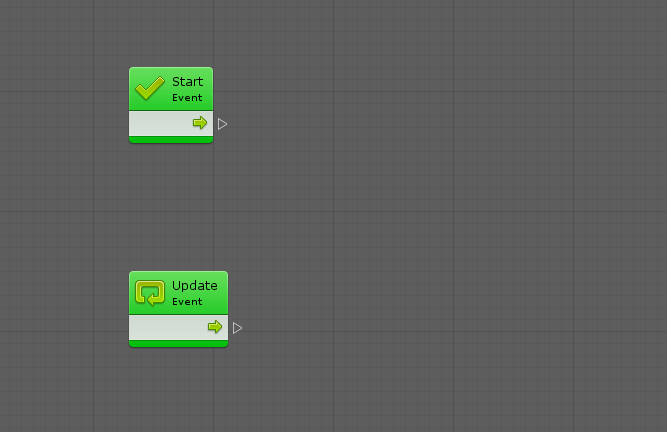 The player prefab in the project already has a Rigidbody 2D component attached. All we have to do to make the player move is tell it at which velocity (speed) to go... and we just calculated that! Velocity on 2D rigidbodies is a 2D vector: it has a X component for the horizontal speed, and a Y component for the vertical speed. Because we only want to affect the horizontal speed, we'll have to keep the vertical speed intact. Next we'll add a new part to our graph to flip the player in the direction of the movement. To do so, we only have to change the scale of the player game object on the X axis. When going right (movement > 0), the scale should be +1, because the sprite is already facing right. When going left (movement < 0), the scale should be -1, so the sprite gets flipped to face left. When not moving (movement = 0), the scale should not change, so the player stays in the direction of the last movement. The Y and Z axes of the scale should remain at 1. The last part of our movement graph will be to play the run animation. All we need to do on Bolt's end is to pass our movement speed to the animator. Because we're passing a speed and not a direction, we'll need to make our Movement variable absolute before passing it. This way, if we're going left at -5 movement, we'll tell the animator we're going at 5 speed. This way, whether or not we flip the player, we'll still update the animation. Bolt supports connecting multiple control outputs to a single control input for these kind of scenarios. If you test now, the animations will play properly. Movement code: check. Hurray! Because our player is a physics rigidbody, implementing jump is as easy as adding an upwards vertical force. Just like the Horizontal axis we used before, Jump is a default Unity input for new projects, mapped to Space on the keyboard. If you test your game now, you'll be able to jump! To fix this, we'll need to create a ground check. This part of the graph will use a raycast. This means we will throw a ray from the player's belly towards the ground, and check if we hit a platform within a small distance. If we did, it means the player is grounded; otherwise, it's in the air. Direction: The direction in which we'll cast, in our case down (-1 on the Y axis). Layer Mask: On which layer(s) it should check for a collision, which we'll set to Platforms only. To get the layer mask dropdown, search for Layer Mask and choose Layer Mask Literal. This graph can be read as: "Throw a ray downwards from my position with a 0.3 thickness, and check if it hits an object on the Platforms layer within 1.1 units". This will expose all the items in the raycast hit result. To check whether we actually hit a platform, we only need to check if the Collider is equal to Null (none). If it is, we didn't hit a platform and the player is in the air. If it isn't, we found a platform below our feet and the player is therefore grounded. Now, the player can't double jump anymore! We also need change the sprite when the player is in the air. The animator controller is already configured to take a Grounded bool parameter. The only thing we need to do from Bolt is assign it. To do that, we'll copy-paste our ground check code at the end of our previous animator section, then use the Set Bool unit. In scripting, there is a very important principle called DRY: Don't Repeat Yourself. What we just did to change the jump sprite broke this principle: we copied and pasted the same part of our graph twice. Now, if we wanted to make adjustments to our ground check code, we'd have to change two places every time. This may not seem so bad now, but what about when we'll have enemies doing multiple ground checks too? We'd have to update our graphs in three or four or even more places every time we make a change. Yikes. Fortunately, Bolt provides a way to reuse the same graph in different places called Super Units. We will use super units to turn our ground check graph into a single unit that we will use for both the double-jump prevention and the jump sprite. We have a problem here... Where is the result of the ground check? How can we connect it to the Branch node? We will add a Value Output for the result of the ground check. Set its key to groundedand its type to Boolean. If you want, you can give it a label and summary to add documentation to the graph inspector. Lastly, connect the new grounded port with the result of the ground check. If you play your game now, nothing should have changed. But your graph is now a lot cleaner, DRYer, and easier to maintain for the future. Finally, apply the changes to your prefab so that the object variables like Speed and Jump we created are automatically added on other player prefab instances in the other scenes. Whew! The ice is broken, and you now know most of the basic concepts you need to use Bolt. Take a moment to review what you've learned, make sure you understand, and stretch your legs. Next up, we'll be adding a death mechanic to our games. 8.1 Preventing double jump took me a long time to figure out that I need to delete "Jump" group we made before and replace it with "Add Force". There is no mention of that. Would be cool if You fix that! I got lost at that point too, I had no idea the "add force" group was supposed to replace "jump" either. Thank you for posting this! The "Jump" Group is just renamed to "Add Force" since jumping is just an add force function. You don't have to delete that group, you can just rename it. I'm still stuck on that, the instructions for this aren't very clear, esp for beginners. Yeah this is a bit tricky for beginners. You have to create a new layer and name it "Platforms" and apply that layer to the 3 platforms in the game under "Level" in the hierarchy. Then go back to the bolt editor and in your Ground Check group find Layer Mask and select the "Platforms" layer you made. Also make sure that the Player gameobject layer is set to default. The character is still able to make double jump. I am trying this tutorial through script, can some one post a code version for double jump checking. This is to check strength of VS tool. What is in your options for Codebase > Unity Engine > Vector 2? What show up if you search for Get Y? I have the same issue here. Has Get Y been changed to just Y? I've been searching for Get Y for a long time and am starting to think I either don't have it, or its name has been changed. I'm pretty excited to learn how to program, but early on I'm already having an issue where Unity doesn't seem to be accepting my spacebar input for Jump. I press space and nothing happens; all other controls work. Project Input shows Jump is mapped to space (although it seemed to be mapped to x axis originally before I fixed that.) Either way, nothing happens. Is something wrong? Aha! I think I figured it out. In the tutorial, it says Rigidbody 2D is found in Codebase. If I use the one under Player instead, it works. ArgumentException: No variable name specified. check your writting is the same as the tutorial! I checked to see if mine was the same but it appears that I already spelled Horizontal correctly and with a H.
Im afraid not, sorry. I abandoned the tutorial a few weeks ago; figured there's no point following a tutorial for a previous version of Bolt. I ran into a problem here: Layer Mask: On which layer(s) it should check for a collision, which we'll set to Platforms only. There was no 'Platforms' layer option in the drop down. I looked and there didn't seem to be any layer in the project called Platforms. I created one, and put the platforms on it, and it seems to be working - is this the correct solution, or did I miss something that was already there? That is the solution, but you should have had that set up from Section 1.3. You might want to double back and check your layers to make sure you aren't missing any others. In section #5 can someone explain the purpose of the "Branch" node. I'm new to programming. Purely as a novice, it makes sense that if A < B it would flip the scale to -1/1. That said, if I remove the "branch" it clearly breaks. But I don't understand is why. If I remove the branch, I see signal is getting passed on (from the A <B comparison to the Select. To me it reads as if a signal is being allowed to pass, despite no movment (thus being neither greater or less than). Which is confusing to me. Appreciate any help. The BRANCH is for "Check" if the condition is true or false. There is not Option for Codebase when i select the player and right click in the Graph editor why is this happening?? When reopening the project I realized the Bolt wizard appeared again. In the Wizard, make sure you click generate under the Types tab. It resolved the issue for me. Indeed, it just means your unit options database was not generated yet. You can also generate it from Tools > Bolt > Build Unit Options. This Visual Scripting Tool is Useless i'd Prefer to Write Code over this. the Interface is Poor, it slows down the Unity Editor. Today is my 2nd day with Bolt. and i am leaving today. I could have used my money elsewhere. Hi Nalayak, I'm sorry Bolt does not meet your expectations. Can you explain tell me more about why you feel the interface is poor in a private ticket? Thanks! I liked the tutorial and I'm enjoying getting used to Bolt, I must note that the walking animation had a terrible keyframe setup and the character "blinked" out of existence at frame 8 or 9. Went back and fixed in it the animator. Other than that everything seemed to work as explained. Hi Christian, thanks for the report, fixing this & reuploading the template package. Tutorial is great (I much prefer text based tutorials to video ones), but for anyone struggling with the initial jump not doing anything please note that setting this to 12 is not enough to get the initial imported character off the ground. You'll either need to lower his mass, or change the jump value to 300. Hi, in item 8, part "search for Layer Mask and choose Layer Mask Literal." Dont have option the platform, have other mode? Hi, could someone please help me out. I was able to move/jump just fine until adding the "preventing double jump" lines. here's what my current state looks like. I'm using the most current version. Well, it's zoomed out, so I can't see the details, but what's the problem? It looks like the nodes match, so what's wrong? Same issue here. I've followed the instructions and it seems to add velocity to the jump rather than stopping the ability to jump until in contact with the ground. This means that the first jump is approx doubled and all subsequent jumps in the air are with normal force. A+ on this tutorial - It took a while, but I made it through! - Focus Graph Object Quickly: Zoom out, click graph object, zoom back in. - Create a Group: Holt CTRL + Left Mouse Click Drag (create a square). - Resize Group: Use the corners of the group with your mouse to see the resize icons just like window resizing. After you learn how to do the above, learning how to do the rest will be easier to figure out. Anyone figure out how to properly set up jump and how to properly set up the ground check? I can get jump to work, but have a variable of 12 has my just bump up. The ground check, I can in some instances, do a double jump. I noticed that 12 is used because it's the amount of force to be applied. It could be 15 or even 20 depending how high you want to go. 1. Make sure your Jump isn't set to "Force"... It should be "Impulse". 2. Your Ground Check is basically just an invisible check of the distance between the Character and the Platforms. Note that "Spikes" aren't considered a Platform, so when you touch those you can't jump anymore. 3. Double Jump is happening because when you Jump it's supposed to do a "Ground Check" first. If the "Ground Check" says "I am on the ground" then you can jump. If you're not on the ground, it should say "I am NOT on the ground" which would then prevent the jump. Trust me, it's confusing to get into Raycasting and other things like 2D Collision at the 2nd part of the tutorial, but for things we don't understand, we just have to make sure we follow the tutorial EXACTLY as it is setup. My biggest recommendation is to back-track to the point where you know your character is working correctly and interacting correctly, and then proceed with tracing your steps past that point (versus their screenshots). If you click the screenshot images above they should enlarge -- It's imperative that you match your Graphs exactly as their screenshots are, and if something is confusing that you don't understand, just ignore it and match their Graphs to get the project working. Advice: Go back and make sure you match up your Graphs to their Graphs and test each section until you finally get it working. Ray casting (or Circle Casting) is an invisible bubble from POINT A -> to POINT B (or the size of the bubble). The concept is to expand the size of this invisible barrier until it interacts with another object... Such as a bubble growing in a room (a huge bubble) starting from Player # 1, which eventually gets so big it touches Player # 2 (which causes the Ray cast to interact with that object since it touched it). This is used in games for things like shooting bullets at players, or in this case creating a ray cast of 1.1 in length from your character to see if it touches a Platform, ie: Ground Check. Collision is simple to understand. Is Object A touching Object B? But also, what else is Object A or Object B touching can be handled by Collision. You could be colliding with 10 things at the same time... Such as: 1) you're colliding with the platform (because you're walking on it).... 2) You may have entered a cloud of smoke (you're colliding with that cloud of smoke, ie: an Object of smoke). The list goes on, such as colliding with a wall, preventing players from passing through walls, etc. The instructions do not work from the very beginning. 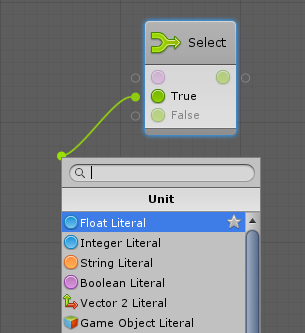 I never get the items in the "Graph" that I am supposed to get after selecting the "Player" object and performing the "Add Component" to add the "Flow Machine". My experience with Bolt, so far, has been terrible. All of the instructions for installation and usage of the product are either incorrect or incomplete. This was indeed changed in v.1.3, I updated the instructions in this part and will review all the other parts for outdated instructions. Thanks for bringing it up! I was able to get from Page 1 through Page 7 before stopping - but not because things were bad (or not working out for me) but because I had gathered enough tutorial for now to learn how things work. Some of these issues are not bolt, they're Unity itself. Sometimes clicking on the object should automatically fill the graph window, but clicking it again, or clicking on another item and clicking back does the trick - or clicking Edit Graph on the right does it. You have to get used to it. But Bolt works great, there's nothing wrong with it - and if there is you should help improve the product by providing bug reports since we don't know what version of Unity you're using, etc. "Float literals will be at the root of the options if dragged contextually from the Select node"
No, they're not! Please help as I got stuck and can't move on... Contextual menu starts with "string", there're no float/int variables and I've looked everywhere! Okay, I got it sorted out. Looks like it was caused by some issues during importing Bolt into Unity. I went to Tools/Bolt/Unit Options Wizard, performed setup with all default options, rebuilt unit database and it worked fine! I'm having some trouble with the walk animation. It works, but when I stop moving either left or right rather than stoping in the idle position it flickers rapidly between the walk and idle states. I notice that when that happens my movement variable for the animation is not resetting to 0. But rather stuck at some arbitrary number between 0 and 5 or 0 and -5, depending upon which direction I'm moving. The variable comes from the earliest nodes where basic movement was defined. Which reads as 0 here, but as 0.17 where it's trying to animate. Figured it out. I had the flow going from the Vector 3 (Create Vector 3) to the Animator (Set Float). Instead I needed to have the Vector 3 (Create Vector 3) plugged into Transform (Set Local Scale) and from there the flow goes to Animator (Set Float). Though now my question is why? Ah, okay, after further examination of the Flow Graph the answer is obvious. The flow never enters those nodes that end with the Vector 3 (Create Vector 3). All of those nodes are just setting up the information for Transform (Set Local Scale) and the preceding Branch. Thus the flow cannot continue from that point. Makes sense. I can't find it either manually or using search. Unfortunately, in 2019.1, this was an opt-in feature. In 2019.2, it's the standard. You might encounter other problems as well, as Bolt is not designed to be compatible with Betas. They'll fix bugs, but you might encounter some things that they haven't seen yet. If you're looking to learn bolt, I'd recommend 2018.3. Once you've mastered the Bolt basics, tackling the new Unity systems in the newer versions should be a piece of cake, as you'll only be learning one thing at a time.